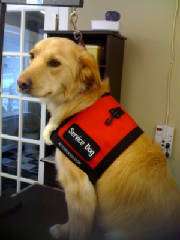 On this page you will find dogs adopted from Safe Haven Pet Rescue that are trained as service dogs. I adopted Kerry from Safe-Haven Pet Rescue on December 19, 2009. I knew from the moment I saw her that she was the dog for me. I had polio as a child and was looking for a successor to my assistance dog, Rick, who died on Remembrance Day. Kerry is a border collie/golden retriever mix. She is gentle, calm, intelligent and very focused. She loves to work. 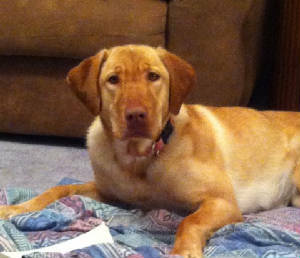 With the help of our trainer, Jordan Fines, Kerry has become an extraordinary assistance dog. She opens drawers and the refrigerator to retrieve items I request, she picks up anything I drop and helps me up from the couch or chair or park bench. She assists me when we walk together to maintain my balance, she takes out the garbage, helps me make the bed and do the laundry and can get me up on my feet if I fall. She also assists me with my exercise program by steadying me. Without her calm, reassuring, helpful presence I would not be as independent as I am. Kerry and I live in an apartment. She is a very active sociable dog who loves her walks in the parks where she can romp with other dogs off-leash. While in the parks, she continually checks on me to be sure I’m okay. Whenever I blow my whistle she comes running back to me. Her dependable nature makes me feel safe. I am so very grateful that Kerry came into my life. Rusty was adopted from Safe Haven Pet Rescue 8 years ago. 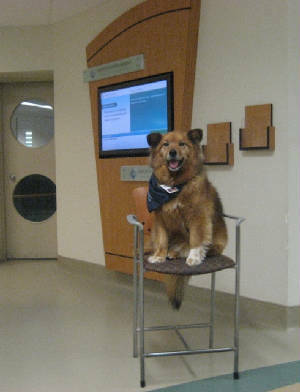 He is now working as a therapy dog. Hershey & Buddy (a.k.a. 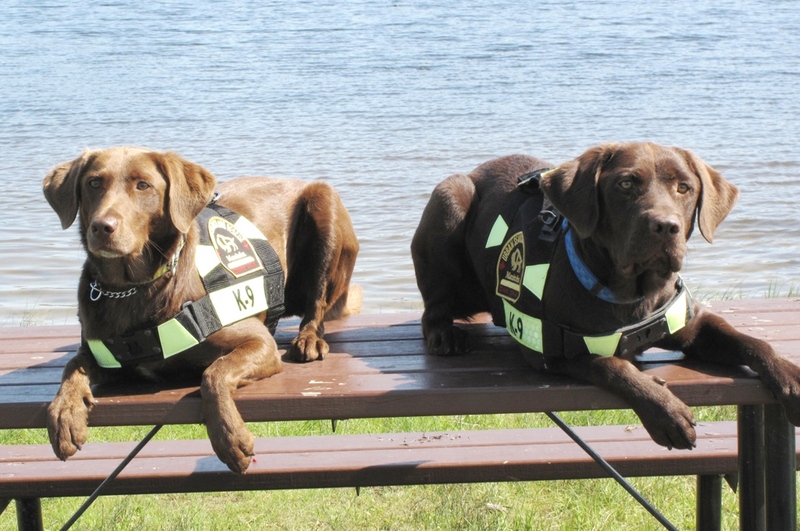 "Flash") - Labs that are now working as Search & Rescue dogs. "Buddy" at work in Vancouver for the Olympics 2010. Trainer Cliff Samson and Flash, who has passed two national explosive-detecting tests with flying colours, gets bomb-detection duty. 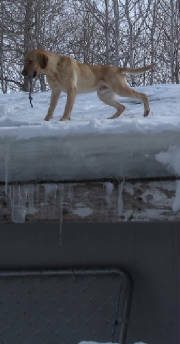 It's a pound-to-podium dream for Flash the Labrador from Manitoba who's earned a trip to Vancouver for the Olympics. 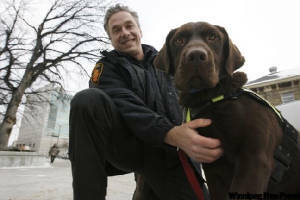 The former stray dog will now be sniffing for explosives in Vancouver, after a whirlwind 15 months where he went from a shelter near Steinbach to a job as a trained bomb hunter for the Office of the Fire Commissioner (OFC). Now, the one-time rescue dog and his trainer, Cliff Samson, will be at the Olympics for the next six weeks providing security for global VIPs. The RCMP contracted the two to help ensure Olympic sites are safe for spectators, athletes and international celebrities. 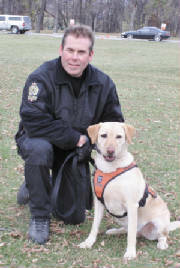 "If you've got an explosive-detector dog, going to the Olympics is probably got to be the highlight of your career," said Samson, the OFC's canine program co-ordinator. "It's on the world stage. All of the atmosphere that goes along with it, I'm really looking forward to it." 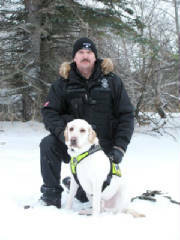 Samson is a retired 26-year veteran of the Winnipeg Police Service who once ran the canine unit. He's now employed by the OFC to train search and rescue dogs. Samson has provided security for luminaries like Gov. Gen. Michaëlle Jean, former U.S. president Bill Clinton and Queen Elizabeth when they came to Manitoba. Now Samson is bringing Flash along as his partner to Vancouver. The two hit the road Monday for their trip to the West Coast. 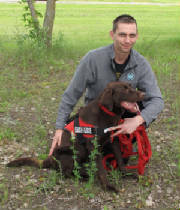 Flash is trained for search and rescue missions, as well as for explosive detection. On Monday, the 70-pound pup gave visitors a friendly lick before jumping up on a York Avenue garbage disposal, sticking his long nose into openings to get a good whiff. If Flash smells something suspicious, he alerts Samson by sitting down. Samson found Flash after he was alerted by Hilda Hiebert, the founder of Safe Haven Pet Rescue. She'd taken the stray dog from a pound and noticed he had a strong "play drive." 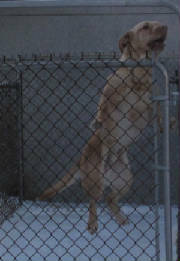 Flash was about 18 months old when he met Samson in Steinbach on Hiebert's lawn. "Nobody wanted him," said Hiebert. "I showed him to a number of people." 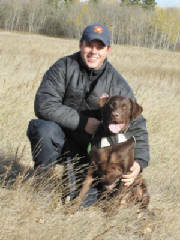 Now, about one year later, Flash's passed two national explosive-detecting tests with flying colours. "In this instance, it worked out great because he not only got a second chance at life but he's also famous, " said Samson. Flash was named by OFC employees -- a fitting reference to the subject matter he deals with such as flash fires or flash-bangs of explosives. "He's got big sad eyes that everybody loves," said Samson, who said he's teased because Flash is a "chick magnet." "He'll tilt his head. It's like he's listening and trying to understand," said Samson.